Laser technology is a safe and reliable method with no mess to clean-up afterwards. While alternative cleaning methods (chemicals) can only re-expose a fractional amount of the capacity, laser cleaning cleans a cylinder of 2 m in length and 30 cm in diameter in about 40 minutes time down to the pores. Result: Consistent high printing quality printing. Moreover, the time between cleaning can be increased by up to three times. 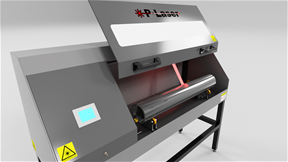 Laser cleaning reduces equipment set-up time, scrap rates and costs. It improves equipment production availability while increasing service life. The laser method is suitable for UV cured colours and coatings containing reactive components such as acrylic and meth acrylic modified polyester resins. Cleaning can easily take place in standby mode so that UV lights are preserved. With our years of experience, cleaning printing rollers on-press, we now offer an Off-line cleaning system. This gives companies the possibility to clean their printing rolls within hours instead of days. You don’t need to worry about the delicate and costly transportation from now on! No damage is done to the rollers as they are cleaned repeatedly either on line or off line. The hole depth increases significantly, taking your print quality is taken to another level. In a lot of situations it is only possible to clean the roller in situ on the press. We can offer linear drives which can easily be mounted in front of the roller, you can choose between electrical en pneumatic driven systems.